The benefits of reading are known to almost everyone, yet few people I know read more than a book or two a year (maybe zero). It’s a travesty. Strong reading habits are the most surefire way to growth knowledge, vocabulary, and perspective. By reading about events, concepts, innovations, and theories – we become more creative, more skeptical, and more inquisitive about the lives we have chosen for ourselves. We have access to unprecedented knowledge; millions of books at our fingertips on every subject imaginable. 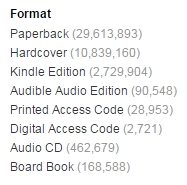 Below you will find a list of available books by type on Amazon.com as of 9/30/2015. Check out those massive numbers. Over 40 million print books and 2.7 million Kindle books are available to buy with a few clicks of the mouse. I live in a big East coast city so I spend a lot of time walking and riding public transportation. I’m usually on the move, making eBooks ideal for my current lifestyle. My choice for books begin and end with Amazon’s Kindle store. In the past few years, I can count on one hand the amount of titles that were unavailable in digital version. Every book you want can be purchased and transferred to all your devices instantly. I’ve never had a single issue. Once purchased; I use the Amazon Kindle app on my phone and tablet, and the Kindle Cloud Reader on my computer to read the eBook. 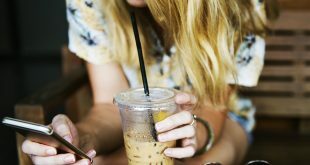 Kindle allows you to sync between your devices – meaning you can pick up right where you left off, even using a new device. My favorite feature is the ability to sync to the furthest page read. Switching between two devices couldn’t be more easier. If you’re like me, you hope to internalize and apply the books you read. Not many people spend meaningful time reading a book where they have no desire to retain the concepts within it. I gravitate towards non-fiction – self-improvement, historical pieces, biographies, etc. – books that pack a heavy punch and leave a trail of timeless advice. Important information will be lost if you don’t have a good note-taking system in place. Before the eBook became popular, people would highlight pages and take notes in the physical book, using pen and paper. Talk about old school. That is a painstaking and ineffective method, and is unnecessary in today’s digital world. That is where Kindle Highlights comes into play. 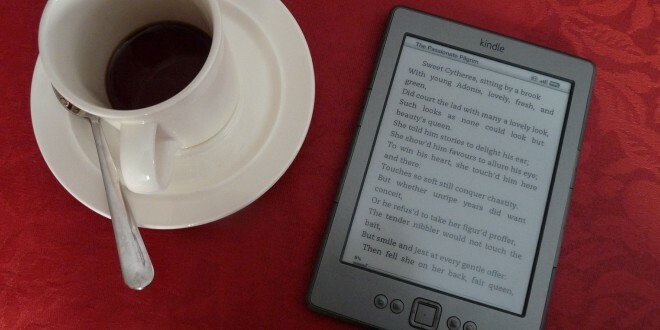 Kindle Highlights are a mechanism for highlighting excerpts of text from your Kindle eBooks. Want to retain knowledge far after you finished a book? Learning to use Kindle Highlights effectively is the first and only step you need. When you download a book from Amazon’s Kindle Store, it sends it to your Kindle library (Amazon account required). This library is synced up across your devices. Kindle allows you to add your own personal notes and highlights throughout the text.This is a great feature if you want to capture your thoughts, questions, or a profound cluster of text. Hold your finger down on the first word you want to copy and drag until the last word. When you release, a pop-up box will appear. The first icon is a highlighter. Click this to highlight text. I use Kindle Highlights with every eBook I read. I retain key takeaways, concepts, theories, and actionable items from the books I read. With my thumb and a few clicks, it takes only seconds to highlight and save relevant text for later. Pro Tip: Your personal Kindle Page also has a “Popular Highlights” section which aggregates the most popular sections of highlighted text in any given book. Simply go to your personal Kindle Page, click on ‘Your Books’ and choose the book you are looking for. Once selected, there will be a list o Popular Highlights on the right side of the screen. Upon finishing an eBook, my process is simple and effective. Click on “Your Highlights” at the top of the screen. This brings you to your book highlights, in chronological order, with your latest book at the top. This is a hindrance, and there is a quicker way if you are looking for a specific book. Click on “Your Books” at the top of the screen (see image above). You will now see all your Kindle eBooks in alphabetical order. Once you click the book you want, you will be directed to another page which I have added below for a book I recently finished, 48 Laws of Power. As you can see, I highlighted 474 individual passages in 48 Laws of Power. Click on the blue text (see arrow) to access your Kindle Highlights. As you can see, Amazon let me save only 439 of these passages. The author doesn’t want you copying out massive chunks of the book. Stinks for the reader, but makes sense. You will find that every book has a different limit, and some books have no limits at all. Remember to highlight wisely, only choosing relevant, need-to-remember text. Pro Tip: Make sure to highlight the Chapter name and details while reading your eBooks. Otherwise, you will be confused about the location of your highlighted text in reference to the actual book structure. Capturing the chapter titles (and to a lesser extent, sub-headers) allows you can efficiently organize your Kindle Highlights. When I read 48 Laws of Power, I made sure to highlight each Law # and Law Name, so the accompanying notes could easily be grouped under each Law. Otherwise, I wouldn’t have known which Law the text referred to without going back to the actual book and wasting time. Exporting your notes is simple. Click on the blue text (see arrow) in the above graphic which references your saved Highlights. Use your cursor to highlight the entirety of your notes. Right click and copy. Open whatever word processor you use – Microsoft Word, Google Docs, etc. Pro Tip: If pasting to Microsoft Word, paste as plain text to avoid any formatting headaches such as page breaks and such. At this point, all you need to do is format the text to your liking and you’re are good to go. Make sure you are only highlighting relevant text, as I found my notes from the past two books I read were each over 60 pages each!! Pro Tip: When you export, you will see that each individual highlight has text at the end – underlined in the picture below. This is useful on the Kindle website or app to navigate the that place within the book- but we have no need for this text in our word document. Simply use ‘Find and Replace’ to delete out these words in bulk. I Exported My Notes, What Now? Once my Kindle Highlights are formatted properly, I save the document as “Book X Notes.” I have a folder where I keep all my notes from the books I have read. I often revisit these files, creating notes and writing down information I want to use or apply to my life. This method has been an invaluable resource over the years. You can also use a resource like Evernote or a commonplace for storage of your book Highlights. That’s the process. It is quick and easy, and allows you to reference back to eBooks you may have read years ago. No longer will a book be lost over time due to a foggy memory! Remember to be proactive while reading: Highlight relevant text that you want to remember or reference later. Always Export: Paste into a word document and save all your book highlights in a centralized location (back these documents up as well). Don’t Forget: Once your Kindle Highlights are saved into a word document, don’t forget about them. Use them as a mental refresher on the book’s topic and as a way to extract meaningful information. Read in volume and across many areas of focus: Reading has been the greatest accelerator of my knowledge growth without question. Let me know below if you have any comments or questions about the use of a Kindle to highlight and take notes. Stay highlighting!